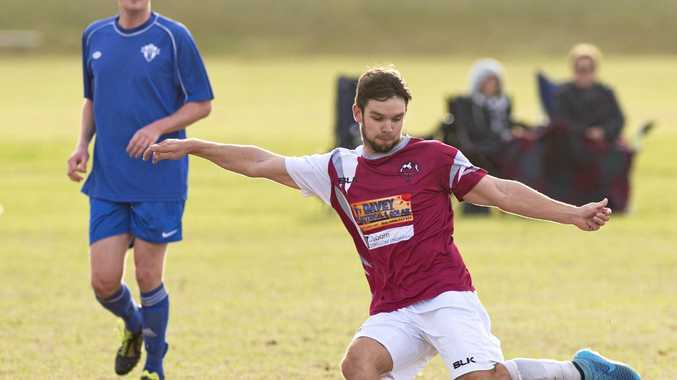 FOOTBALL: Five years after playing for the South West Thunder in the National Premier League, Matt Carey is the leading goalscorer for Warwick Wolves in the conference grade in Toowoomba. The Wolves had a late start to the season but have moved into the top four after only three games, with two wins and a draw. Warwick has scored 13 goals, six of which came from Carey. Carey played junior football in all age groups for South West before playing for the Thunder in the NPL in 2014. Since his time with the Thunder, Carey has had three major ankle injuries and two operations but is happy with his fitness for this season. After playing most of his career as a striker, Carey had been put at right wing for Warwick where he links with Nick Spence and Sam McLennan. The move has worked, with Carey netting six goals. "I have a lot more space on the wing and have been given a roaming role,” he said. "New coach Bernie Lopez has coached in Europe and has a great knowledge of the game. While he admits the conference grade isn't as strong as premier division in Toowoomba, Carey said he wanted to be out there playing. As well as football, Carey plays futsal and touch footy. A carpenter, he works for Graeme Collins and at present is working on the old Parmalat building in Victoria St.
On Sunday at 1pm, Warwick will play Goondiwindi in a fixture game. "It am looking forward to playing at Goondiwindi for the first time this weekend,” he said.